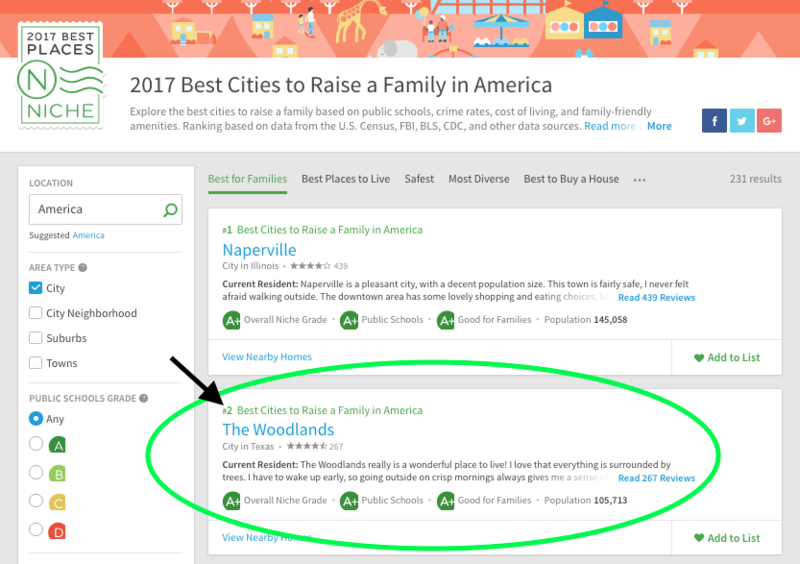 According to Niche, an online resource for schools and neighborhoods, The Woodlands has been ranked as the number 2 “Best City to Raise a Family in America” with an A+ overall Niche rating. The number one spot was given to Naperville, Illinois. Niche assessed 15,711 places in the United States and rated the best cities to raise a family based on public schools, crime rates, cost of living, and family-friendly amenities. Ranking was based on data from the U.S. Census, FBI, BLS, CDC, and other data sources. The Woodlands was also ranked #4 in Best Cities to Buy a House and #6 in Best Cities to Live in America. View the complete list, The Woodlands’ full report card, and resident reviews at https://www.niche.com/places-to-live/search/best-cities-for-families/. Niche is a website helps online visitors “to discover the schools and neighborhoods that are right for you” in which their team “rigorously analyze dozens of public data sets and millions of reviews to produce comprehensive rankings, report cards, and profiles for every K-12 school, college, and neighborhood in the U.S.” To learn more visit Niche’s website at www.niche.com.